Antoine-Joseph Wiertz was a Belgian painter (1806-1865 AD). His paintings were so large that it was impossible to take them out of his workshop, located in a rundown neighbourhood of Brussels. The building became a museum, and Pierre Lidiaux was convinced that it was a point of Passage 1). Antoine Wiertz is a little known, but fascinating example of a Romantic artist. He won the Prix de Rome, a paid fellowship which allowed him to paint in Rome, in 1832. On his return he was warmly welcomed in Belgium, but met with little success in the Paris Salon, to which he submitted several works. In 1850 the Belgian government offered to build a studio for him in exchange for a number of works or art. The studio is now a museum, and is located in the Parc Leopold, not far from the Cinquantenaire Park. Despite this official success, he never received the full measure of recognition that he felt his genius deserved. 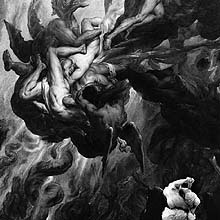 His paintings are often huge, matching his ambition and ego; in size, at least, he tried to rival Rubens. 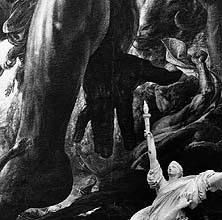 One patriotic canvas celebrating The Apotheosis of the Queen (1856) was projected to be 150 feet high, though it was never completed. Another aspect of his Romanticism was his strikingly imaginative subjects. He was drawn to morbid themes, such as the image of mortality embodied in The Two Beauties: La Belle Rosine (1847). Other astonishing works include The Suicide (1854), and The Last Thoughts and Visions of a Decapitated Head (1853) – a triptych, no less. Despite the morbid nature of this triptych, Wiertz meant it to be a statement against capital punishment. The painting is in a poor state of preservation today, because Wiertz experimented with a variety of painting materials which did not hold up well. He disliked the slickness of oil paint and tried to create new techniques for achieving a matte surface. Although we do not know what crime the malefactor in Wiertz's painting had committed, the horror of his execution is starkly emphasized. The guillotine had been most well known as a tool of the French Revolution and especially the Reign of Terror, but had become also an instrument of the conservative Restoration. Many Romantic artists opposed the death penalty for political and humanitarian reasons. Although the guillotine was invented to be a more humane means of execution, doubt lingered as to whether death was really instantaneous. Wiertz seems to have been inspired by some of the writings of the period which speculated gruesomely on the last moments of consciousness of the severed head. An early novel by Victor Hugo, Le Dernier jour d'un condamné (The Last Day of a Convict, 1828) seems particularly relevant. Death and Romantic horror obsessed Wiertz. He was particularly attracted to these themes in Romantic literature, and a number of his works are based on novels and stories. The Premature Burial of 1854 is clearly inspired by Edgar Allan Poe. Wiertz also painted images of Quasimodo and Esmerelda from The Hunchback of Notre Dame by Victor Hugo 2).